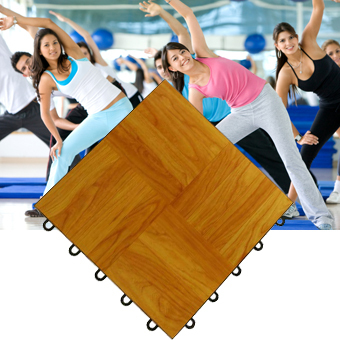 Introducing our revolutionary, snap-together, modular floor tile for home and sport use. MAX Tile is simply the best vinyl top, modular floor tile on the market. We offer it at unbeatable prices, factory direct to you. Made in the USA, it comes with a 10-year, limited lifetime warranty. It also features a 15-year, waterproof wear layer surface. This innovative, raised-floor tile system offers versatility for all types of residential and sports flooring installations. It can be used in a number of different applications including basketball courts, gym floors and aerobics floors, portable dance floors, and residential basement floors. MAX Tile can be easily assembled and disassembled as many times as needed. It is perfect for residential basement flooring tiles, athletic facilities, or multi-purpose spaces such as church common areas. The surface of this vinyl tile features a scratch resistant texture that is designed for heavy traffic. It can easily withstand regular usage of tables and chairs during the day and an intense basketball game or aerobics class at night. Tray colors will match most of our wood grain designs. MAX Tile is a seamless, attractive floor surface for your sports or athletic facility. The commercial-grade luxury vinyl surface is 3 mm thick and is available in many appealing wood grain and stone designs. Spruce up your basement floor with a simulated wood grain that is warm and comfortable. A final note on quality: We have engineered this modular, snap-together tile better than the competition. MAX Tile is designed for repeated assembly and dis-assembly with no loss in tile tightness. MAX Tile can be used in permanent applications as well so it can meet a variety of needs. It is fantastic for portable dance floors of all kinds, exercise flooring, gymnasiums, trade show flooring, basement floors, and utility rooms.